I thought my eyes had surely deceived me when I stepped into Kamuzu Central Hospital in Lilongwe, Malawi. Imagine three to four children on a bed with no linens in a stiflingly hot children's ward. Each of my senses was overwhelmed - the sight of poorly pieced together CPAP, the smell of urine & stool, the feeling of leaning into unknown dampness on a patient's bed. The conditions the children received medical care in were astonishing, but I had to dive right in and try to navigate my way with limited resources. During my stay, I had the opportunity to care for children in the Emergency Zone which functioned as a high acuity ward / resuscitation bay. In just the first three days, I watched seven children die despite our efforts to save them. Somehow, in the last two-and-a-half years as a Pediatric resident, not one of my patients had died, so seven in just the first three days of my arrival was unbelievable. There were some children that died of diseases easily treated in the States but there were many more dying of illnesses we only read about in textbooks back home. Primarily, they were dying from consequences of malaria - severe anemia and cerebral malaria. We had to run to the blood bank multiple times per day to beg for more pints but there was simply never enough. This meant we had to sit down every day and look at our list of anemic patients and determine who needed the blood the most and try to prioritize those patients. This put a knot in my stomach every single time because I had to see the look in each mother's eyes as they saw another child receive blood while their child kept waiting. Although the hospital was short on many things (e.g. Epinephrine, alcohol swabs, CPAP tubing), there was never a shortage of loving parents at the bedside for every single child. The mothers not only cared for their own children but also took care of the surrounding children so that the mothers could each take a break to fetch water/food or take a shower. Every child was loved and no child ever died alone. That warmed my heart. In the end, this experience was both eye opening and challenging. I wish my stay could have been longer so I could help reform the children's ward and continue to teach the medical students. 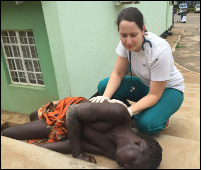 I cannot thank the Benjamin H. Josephson Fund enough for helping make this dream medical mission trip a reality for me.